the AAAI'08 Workshop on Meta-reasoning. July 13-14, 2008, Chicago, Illinois. 11 Dec 2018: Added settee self. Do you have a self-model? Is google part of you? Or part of your self? Dennett's notion of self as "a centre of narrative gravity"
"There are some philosophers who imagine we are every moment intimately conscious of what we call our SELF; that we feel its existence and its continuance in existence; and are certain, beyond the evidence of a demonstration, both of its perfect identity and simplicity. Unluckily all these positive assertions are contrary to that very experience, which is pleaded for them, nor have we any idea of self, after the manner it is here explained. For from what impression could this idea be derived? This question it is impossible to answer without a manifest contradiction and absurdity; and yet it is a question, which must necessarily be answered, if we would have the idea of self pass for clear and intelligible, It must be some one impression, that gives rise to every real idea. But self or person is not any one impression, but that to which our several impressions and ideas are supposed to have a reference. If any impression gives rise to the idea of self, that impression must continue invariably the same, through the whole course of our lives; since self is supposed to exist after that manner. But there is no impression constant and invariable. Pain and pleasure, grief and joy, passions and sensations succeed each other, and never all exist at the same time. It cannot, therefore, be from any of these impressions, or from any other, that the idea of self is derived; and consequently there is no such idea." NOTE: Like Hume, I neither ordinarily conceive of nor experience any such thing! If conditions (2) and (5) are omitted, then I do not object: there is such a thing, namely me: Aaron Sloman. There are many other such things, including you, the reader. But I (like you) am more than a mental thing. E.g. I and, I suspect also you, are things with eyes, and hands, things that occupy space, things that digest food, things that learn, that fall asleep, that will one day die, etc. Below I contrast Galen Strawson's theory (and other similar theories) with an alternative analysis, and the closely related theory presented by Peter Strawson in 1959. My version of this theory is also closely related to (and was originally inspired by) Hume's. Whenever anyone, X, is referring to his self, using words and phrases like "myself" "selfish" "self aware" "selfconscious", and so on, what X is actually referring to is nothing more, and nothing less, than X. In particular it is not some "special" part of X, though what X may be saying about X can be much more complex than the form of words suggests. People who do not understand that this is how words like "self" function in our language, regard it as legitimate to use phrases like "the self", "a self", as if they referred to some kind of thing distinct from people (or other agents), somehow forming parts of people, but not physical parts, and somehow more deeply connected with who or what the individual is -- perhaps even the source of that person's desires, hopes, fears, decisions, beliefs, etc. See Galen Strawson's characterisation above, for example, e.g. condition (8). Contrast Peter F. Strawson's chapter on Persons, in his 1959 book Individuals: An essay in descriptive metaphysics, where he argues that the concept of a person, which has both physical and mental properties, is in a sense 'basic'. I don't know if that sort of concept is 'basic' in any sense, but whether it merits the label 'basic' or not, that is the concept that characterises what I refer to when I use the expressions: "I", "me", "my", "Aaron Sloman", namely a whole person, not any mysterious special part of a whole person. Compare: I can describe a block as rectangular, wooden and brown. It is the same thing that has all those properties. There isn't a shape-block that is rectangular, a material-block that is wooden and a coloured-block that is brown, for example. Likewise a person can have a certain height, weight, location, complexion, collection of interests, thoughts, desires, moods, hopes, fears, and a personality. Some of those aspects of the person may change while others remain the same. But all the while it is the same person. This is an example of a common phenomenon in philosophy: some useful turn of phrase is interpreted as having a very different significance from what it actually has. The attempt to define that special significance often leads to questions, assertions, discussions that, to a first approximation, can be described as complete nonsense disguised as sense. about Fred that Fred wished to conceal. and many more. In each case the use of the word 'self' or one of the related words (e.g. 'herself', 'itself', 'myself', 'themselves') does not refer to some mysterious entity that is a part of a person, but rather refers to the whole of a person (or set of persons in plural uses) whose identity is specified somewhere else in that sentence. As shown above, in some cases more than two occurrences of the referring expression (in place of "X") get collapsed. I could produce many more examples, but I won't, rather: I promise to restrain myself! While the settee was being carried out through the front door it jammed itself in the doorway, slightly damaging itself in two places. As far as I can tell that is a perfectly good use of English and exactly that sentence could occur in a novel, newspaper report, or conversation, even if it never has. Any normal speaker of English with common knowledge of doors, pieces of furniture, and removal processes should have no difficulty understanding it. Could that be the final nail in the coffin of all the anti-Humean theories of self? The syntactic requirements for replacing one or more of the occurrences of 'X' with 'self' are fairly subtle. E.g. you can't do it with 'X is poor and X is honest'. can be rephrased as: John ...something or other... himself. A sentence that can be abbreviated using 'self' requires not just properties (or unary predicates) to be used, but something like a preposition, a verb, or some other form of words expressing a spatial, temporal, causal, functional, or other relation between X and X.
I presume many, if not all, human languages share a similar syntactic device, which is likely to generate the same confusion in many cultures. The power of syntax to generate deep clouds of smoke should never be underestimated, nor the resistance to debunking. Idle speculation: Perhaps in some cultures similar confusion is associated with the notion of "a sake". How could you possibly do something for Fred's sake, if Fred hasn't got a sake? I am not trying to recommend abolition of talk using 'self' on its own or in its usual combinations 'itself', 'myself', 'selflessly', etc. I do recommend the avoidance of certain metaphysical conclusions based on misunderstanding a useful syntactic construct. Those metaphysical conclusions often lead the useful syntactic forms to be extended in useless, obfuscatory directions, often indicated by using 'self' as a common noun with the definite or indefinite article. Unfortunately the analytical philosophical lobe of most brains never gets developed in a normal education. As far as I know (and I don't have complete self knowledge) I have never had a sense of self. I do, of course, acquire, store, use, and lose information about myself of very many kinds. For example I now have a sense of where I am, what I am looking at, what I can see, what my hands are doing, and what I am trying to say. But that was just another sentence instantiating a pattern sentence with multiple occurrences of 'X', where X = "I". And "I" (along with "me", and "my") just happens to be the most useful referring expression for me to use to refer to Aaron Sloman. That's something I can do and you can't -- so what you hear me say, requires you, if you want to remember it and think about it, or work out its implications, to substitute "I" with "Aaron", or "him", or "you", or "that windbag", or "the author of this message" -- you have a wide range of options. Different people have different options, depending how well they know me. I may have more options, but they would all be very much more tedious to use than the simple "I". I also have a sense of things I previously did, things I previously experienced, places I previously visited, things that happened to me, things other people did to me, thoughts I had, desires I had, pleasures and pains I had. It's interesting that to some extent I have information, or at least expectations, about future happenings. I now (i.e. Sun Jul 6 10:37:54 BST 2008) know that I'll be going to the AAAI'08 conference in Chicago, as long as no disasters stop me. Sometimes I even know what I am going to say or type before I finish. E.g. before I typed "sometimes when I type" in this sentence I knew I was going to type that sometimes when I type I know how I am going to finish the sentence I have just started. But I don't always know how I am going to finish the sentences I start. I did not know how that long sentence would end up when I started it. Sometimes, in my case, when I hear what I say the main effect is to make me realise that that is not what I think, so that I need to try again to say something that expresses what I think. The reason for this is subtle and complex: what I think is not a collection of stored sentences, but is distributed over a lot of competences and dispositions whose contents cannot easily be extracted, except by running the system. Mere inspection cannot work. But running the system in an artificial context, e.g. answering the question 'What do you think about so and so? ', will not necessarily produce the same result as running the system in a real context, "with lots more of the variables bound". The ability to do philosophy often requires the ability to short-circuit that process. I suspect that's partly a result of a lot of unconscious self-monitoring and storing various summaries of what the system does. But maybe that mechanism does not work in everyone. Some people are much better at doing the 'short-circuiting' than others. I have found it very difficult to teach that skill: some students pick it up and some don't. Some of the latter make all sorts of false statement about how their own minds work. Like most people I know about many things I can and cannot do. I know I can raise my right arm while sitting here and that I cannot raise the waste paper bin at the far end of the room while sitting here. How do I raise my arm? Just by doing it, and certainly not, as some philosophers think, by first doing something called 'willing it to go up'. I wouldn't have a clue how to do that! (Para added: 24 Aug 2008) My inability to move the waste paper bin remotely could change if future technology allows devices to read information about what's going on in my mind from what's going on my brain, and transfer my decisions to machines that cause objects in the vicinity to move without my touching them. If that ever happens, people may, with practice, learn to move external objects in something like the same way they move their body parts. Initially that may require some specific conscious mental process, such as saying to oneself "Bin move left". But there is no reason why such a thing should remain a necessary precursor to moving external objects any more than talking to yourself is a necessary precursor to lifting your arm. If a lot of that goes on, the already fuzzy boundaries between individuals and their environments will be even more blurred. Some of this is already happening to me (and others) in connection with search engines as discussed below. I also know I can think of many examples of things I can and cannot do. I can recall which house I was in at 10pm last night, but not what my posture was at that time. I might be able to work out which room I was in, but I know I moved around a lot and I don't know exactly when I moved from where to where. But I can work out some of my past locations by checking broadcasting schedules and working out that I must have been in the room where the TV set is, or sitting in the kitchen where the radio is. I can make myself choose a nonsense phrase to think, or a number between 1000 and 1000000 to think about (possibly one I've never previously named out loud). But I cannot choose to think up a valid proof of Goldbach's conjecture. I am pretty sure of that, but who knows, maybe next week I'll have a great new idea and just do it. Most people have no idea where or from whom or what they first learnt the vast majority of the words they use, or the concepts they use, or the facts they have learnt. In general the information is not worth storing because it is of no use. Academics concerned about plagiarism have to learn to remember unnatural things. How do I know some things about myself, and why don't I know others? Those are questions to be solved by future collaborations between AI, psychology, neuroscience, and even philosophy, -- though there are fragments of answers, e.g. concerning which bits of brains make a difference to different kinds of mental competence. However, not only is it the case that we can be mistaken, there are also very serious pathologies in which the inability to do all these things normally can make people highly dysfunctional, even dangerous, e.g. schizophrenia -- a deep and multi-faceted disorder, in which many of the things I've been talking about stop working properly. All that is just a long-winded way of saying what I am not saying when I say I don't have a sense of self. A person can take on different competences, preferences, likes, dislikes, reactions, ways of seeing, ways of acting, ways of speaking, ways of reacting to people, in different contexts. This is probably true of many intelligent animals: a lioness needs very different collections of switched on competences and readily available information (a) when lolling in the sun with her cubs, (b) when a strange male lion approaches as a potential mate, (c) when she is stalking her prey, (d) while she is actively chasing a terrified deer, and (e) when she has caught and killed her prey, etc. A person who is a charming and entertaining father playing with his children can turn into a maniac with road rage while driving his car, can become an overbearing, arrogant manager dealing with underlings at the office, and turn into a pathetic, fawning, nervous wimp when talking to his superiors. Of course, he need not be aware of any of this: often our acquaintances know more about our state of mind than we do (a common theme in novels and plays -- for instance about infatuation or jealousy). We can compare these different states with different states of a complex software system that can load different control parameters and rules to control its behaviour in different contexts, e.g. - in the early stages of booting up, - when an intruder has been detected, - when maintenance engineers are looking for bugs, - when file space is running low and permissions and quotas have to be adjusted, - when connected or disconnected to a potentially dangerous network, etc. Perhaps I should have used the label "selves" or "personalities"??? The switching needs to be to some extent automated -- e.g. it could be one of the functions of the reactive 'Alarm' mechanism. If it weren't automated, the system currently in control might not wish to relinquish control. Or it might take too long. As suggested in the 1996 message listed below, it is possible that dysfunctional versions of the mechanisms involved in switching what I have called "Personae" could account for at least some examples of so-called 'Multiple personality disorder' (MPD). Hypnotism may depend on the fact that the switching can, to some extent, be triggered from outside. But there need not be a sharp boundary between hypnotism and other social influences, e.g. in teaching, preaching, inspiring, threatening, tempting, advertising, application of peer pressure, etc. I am grateful to Yasemin Erden for reminding me that some ordinary uses of the words "identity" "identities" overlap with references to what I have called Personae, though some notions of identity go beyond the notion of the current global control-state of a mind. For example, a con-man can adopt different identities as well as different personalities, in different contexts. A fake identity might be determined by a false passport without any fake personality being involved. This is a very old and useful idea, which has acquired a wider range of uses since the development of computer games and various types of internet based interaction, or even some board games ("I'll be the butcher this time."). For example, you can adopt different identities in different email lists, depending on what you wish to reveal about yourself (sic!) to other members. Many biological organisms (members of "precocial" species) are born or hatched with fixed information processing mechanisms, perceptual capabilities, motor capabilities, motives, drives, and behavioural competences. Alternatively they may change slightly through adaptation to the environment in a process that sets parameters. 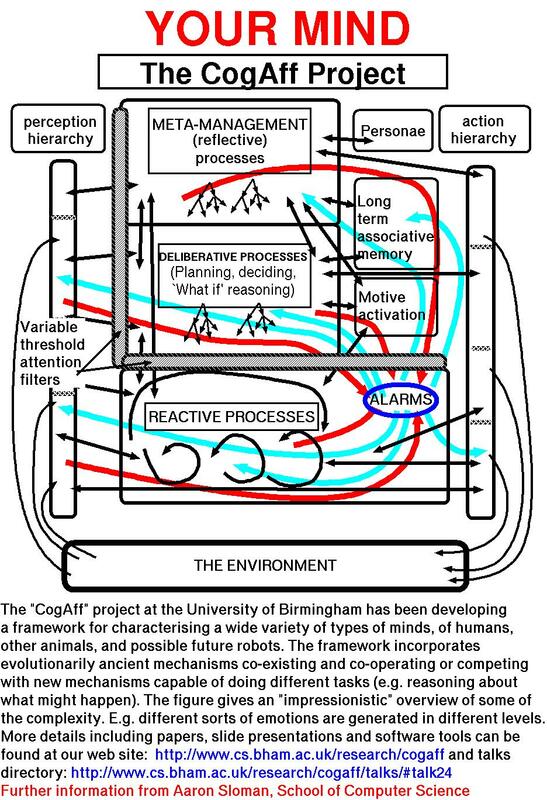 Other organisms (members of what biologists call "altricial species") can change many aspects of their information processing architecture and the resulting competences, along with forms of representation, ontologies, knowledge, values, preferences, goals, attitudes, ideals, etc., during learning and development. Some people who get involved in discussing 'the self' are actually claiming that people have models of themselves. There's nothing wrong about that claim if having a model of yourself is something like having a theory about what sort of thing you are, what sort of person you are, how you work, what you know, what you can and cannot do, what you like, hope for, dislike, etc. and perhaps many other things. In that sense I have a model of myself too, though it is not a unitary thing, and it is not static -- I change my mind about myself over time, and sometimes I learn new things about myself, e.g. from honest acquaintances (especially my wife, who has several times had to draw my attention to facets of myself that I had not noticed, especially facets involving behaviour towards others in discussions). But the fact that we can say that Fred has a model of himself is not an exception to the claim about syntactic sugar above, for it amounts to nothing more or less than the fact that we can say that Fred has a model of Fred. And that is just a piece of jargon for saying that Fred has knowledge, beliefs, conjectures, expectations, hopes, fears, memories, and other kinds of information about Fred -- not all of it correct. Many people seem to have discovered a new way of dealing with the 'tip-of-the-tongue' phenomenon: you know you know a name or word or phrase but just cannot remember it, no matter how hard you try. Later, when you are doing something completely unrelated, you suddenly remember it. Instead of giving up and waiting for the brain to do its stuff in its own time, which used to be the only alternative (apart, perhaps, from attempting systematic searches, e.g. using the ordering of words in the alphabet), some people (including me) have discovered that they can go to google, and type in some carefully chosen related words and phrases, so that the desired item turns up near the top of google's output. As the difficulty in recalling things on demand grows with age I have been relying on this technique more and more. To that extent, google has now become part of me, even though it is not always available. Not all of what I know is always available either. Alas, as the amount of stuff on the internet has grown, along with the priority google allocates to income-generating processes, I have found that the quality of the responses (i.e. google's ability to select what is most relevant to my question and display it near the top of the list) seems to have deteriorated. So google is now more like a rotting piece of my skin that may be discarded than like part of my brain. I have just stumbled across Thagard(2014) "The self as a system of multilevel interacting mechanisms". His view has much in common with mine, except that he does not explicitly mention the concept of virtual machinery, and he seems to have a much simpler model of a typical human mind than the one indicated (crudely) in the discussion of virtual machine functionalism. I think we have the same disagreement with Dennett. None of what I have written is a criticism of the talk by biologists about organisms using mechanisms to distinguish self from non-self. This is just a manner of speaking about real functions of things like the immune system and other mechanisms that have to detect and deal with abnormalities, waste-products, threats of various kinds, etc. It was Catriona Kennedy who first drew my attention to that usage, and at first I mistook it for another example of the philosophical confusions discussed above. Daniel C. Dennett, "The Self as the Center of Narrative Gravity," in F. Kessel, P. Cole and D. Johnson, eds, Self and Consciousness: Multiple Perspectives, Hillsdale, NJ: Erlbaum, 1992. We have many ways of thinking about what we are or have been or will be doing or experiencing. Dennett's notion offers an analogy, partly based on a piece of verbal dexterity, between a central character in a story and the centre of gravity of a physical object. (I suspect he really meant the centre of mass, which is not affected by gravitational fields). He assumes that an object's centre of gravity (or mass) does not really exist: it is just a fictional object. This is an error, since the centre of gravity is no more fictional than the longest dimension of an object, or the midpoint of a ruler, or the point on an object's surface with maximum curvature, or the highest point of a mountain range. The centre of mass (like the centre of gravity) of an object at any time is a location in space (often relative to a frame fixed in the object, if it is a rigid object, though other frames can be used) mathematically defined by its relation to the distribution of mass throughout the object. (or the distribution of gravitational forces). The intended argument seems to be that in a narrative that is the history of some individual, there is a "centre of narrative gravity" (CONG) which is related to all the parts of the history in something like the way in which the centre of gravity of an object is related to the parts of the object. Then, just as the object's centre of gravity is alleged (mistakenly) to be just a useful fiction, so, suggests Dennett, "the self" associated with an individual, analysed as the CONG associated with that individual, is also just a useful fiction. I think this is completely unhelpful because there really is a non-fictional entity associated with the history of Daniel Dennett, namely Daniel Dennett, and he, that particular human being, has all the features required to be himself! There is another objection to the analogy: whereas a physical object has a unique centre of gravity, I, like most people, have a host of different locations simultaneously because I am embedded in different spaces that may have little to do with one another. Some of these are similar to a centre of gravity: E.g. if I am in a train I have a location in the train, and if I move to another compartment I have a different location in the train. At the same time I have a rapidly changing location along the railway line, and I may be moving along it in one direction and simultaneously moving in the opposite direction on the train. I also have locations in and in relation to many other structures that are important, some of them quite abstract (e.g. social networks, roles in organisations, etc. ), and the variety of such locations has exploded in the last 30 years because of the development of computers. (I haven't even mentioned computer games using virtual worlds!) I may also have a place in a novel I am reading, and since I usually have several downloaded research papers open at once on my computer I usually have locations in all of them, remembered for me by the software tool that I use to read them (e.g. xpdf remembers the page I am on in reading a PDF file, if I leave it open). Likewise in things I am working on -- papers, email messages, book chapters or whatever: I can have locations in all of them at the same time, though the locations do not change at the same time. So IF there's any use for the notion of a centre of narrative gravity then I, for one, have many of them. I expect you have also. I don't think I have a substantive disagreement with Dennett (he too quotes Hume with approval): only a difference of style, and a different view about how to help self-theorists discover what is right and what is wrong in their theories. In particular explaining the powerful syntactic and semantic function of words like "self", "myself", "himself", "itself", etc. which enable us to express ourselves (!) clearly and economically seems to me to be more useful and more accurate than inventing mythical entities for those words to refer to. Some closely related papers developing ideas that overlap with the points made here, without explicitly mentioning "the self". Tom McClelland, (2017) Against virtual selves. Erkenntnis. pp. 1-20. Four concepts of free will, two of them garbage. I have a short tutorial on conceptual analysis in this paper on Varieties of atheism. Presentation at Bielefeld (Oct 2007) on Why robot designers need to be philosophers and vice versa. About curing cancer by making a copy of your body without the cancer cells, and making sure the original doesn't wake up. Gilbert Ryle The Concept of Mind (1949) is well worth reading. Unfortunately it is not yet online, as far as I know. Most programming languages give running programs very little access to their current states and processes. Chapter 9 ('Being No One') of Shimon Edelman's new book Computing The Mind: How the Mind Really Works (OUP) 2008. Alas, much philosophical writing on this and related topics could benefit from adopting the design stance, as summarised here.